Call 703-844-0184 if you are interested in options for Ketamine treatment for Depression, Anxiety, PTSD, fibromyalgia, Lyme disease, CRPS, or other disorders. This article looked at the adverse event reporting system, evaluating the ‘side effects’ of Ketamine, which demonstrated LOWER depression rates in patients using Ketamine for pain. These same patients had fewer side effects from those pain medicines as well when they used Ketamine. In numerous settings, we have utilized Ketamine as an adjunct to control pain when opioids have failed (i.e.morphine) with excellent results. Depression affects 8-12 % of the population at any one time and steals away quality of life as well as productivity. Depression is listed as the 4th leading cause of disease burden on the population by the World Health Organization. Standard medications, such as SSRI antidepressants, may be ineffective or take several weeks to begin to have any effect. Ketamine has been shown to result in immediate (12-24 hours) improvement of depressive symptoms in a large percentage of patients. We see the same in many of our office infusions. There is an inflammatory component to depression. This same article points out that Diclofenac, minocycline (an antibiotic), and Botox, also have some antidepressant effect as a result of their anti-inflammatory effects. The bottom line is that Ketamine showed effectiveness for treatment-resistant depression in this article. Current therapeutic approaches to depression fail for millions of patients due to lag in clinical response and non-adherence. Here we provide new support for the antidepressant effect of an anesthetic drug, ketamine, by Inverse-Frequency Analysis of eight million reports from the FDA Adverse Effect Reporting System. The results of the examination of population scale data revealed that patients who received ketamine had significantly lower frequency of reports of depression than patients who took any other combination of drugs for pain. The analysis also revealed that patients who took ketamine had significantly lower frequency of reports of pain and opioid induced side effects, implying ketamine’s potential to act as a beneficial adjunct agent in pain management pharmacotherapy. 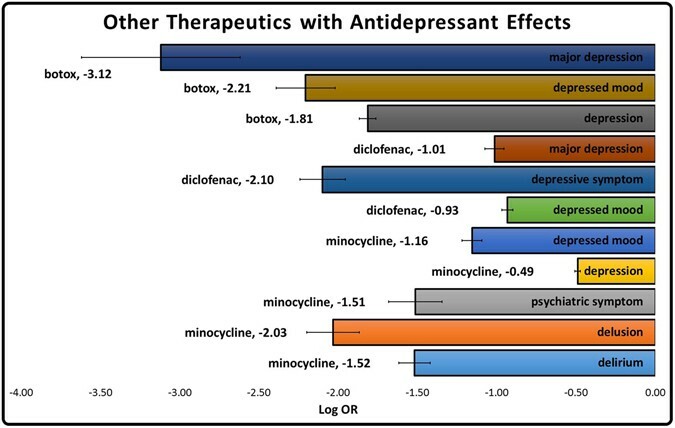 Further, the Inverse-Frequency Analysis methodology provides robust statistical support for the antidepressant action of other currently approved therapeutics including diclofenac and minocycline. The World Health Organization estimates depression as the 4th highest disease burden in the world1. In majority of the countries lifetime depression prevalence ranges 8–12%2,3,4. Current standard of practice of depression treatment consists of five main classes of antidepressants, serotonin reuptake inhibitors (SSRIs) being the most common. Nearly half of psychiatric and primary care patients discontinue their antidepressant therapy prematurely5. The main reasons for the discontinuation of therapy include late onset of beneficial outcomes, lack of efficacy for a fraction of patients, adverse reactions, fear of drug dependence, and lack of mechanisms to enforce adherence5. The initial therapeutic effect of antidepressants is delayed by 2–3 weeks after the first dose and the optimal effect is delayed by 6–10 weeks6. The long lag period renders the standard of care antidepressants ineffective for suicidal patients who can’t afford to wait 2–6 weeks. Aside from the lag in antidepressant effects, there is insufficient evidence that antidepressants prevent suicide during long-term treatment7, and in many cases the antidepressant increases the risk of suicidal thoughts and actions8. Efficacy is another issue affecting depression treatment. In the STAR*D protocol study depression remission is 67% after every drug class and drug class combination is tried9. Because of these problems, some clinicians have been driven to utilize other drugs, such as ketamine, for treatment resistant depression (TRD) patients10,11,12. Ketamine is a drug used illicitly as a hallucinogen and clinically as an anesthetic since 1970’s. It is given intravenously, almost exclusively, due to a lack of an approved oral formulation. There have been some clinical trials where ketamine shows acute efficacy in treating TRD10,11, bipolar depression12 and major depressive disorder with suicidal ideation13, but the number of subjects in these trials ranges from 20 to 57 patients. There are financial and ethical obstacles for a larger scale clinical trial. Here we sought larger scale statistical evidence of ketamine antidepressant action in the FDA Adverse Event Reporting System (FAERS) postmarketing database containing over eight million patient records. Although FAERS was originally intended to track frequent adverse events, with sufficient amount of data, it can also be used to track the beneficial outcomes indirectly through monitoring reductions of related complaint frequencies. Here we apply Inverse-Frequency Analysis (IFA), which looks for statistically significant values of the negative log odds ratio (LogOR). Legend: (a) Frequencies of adverse events in patients on FAERS who took ketamine. Adverse events above 2.5% were reported. (b) Odds ratios were calculated comparing adverse event rates of ketamine patients (n = 41,337) and pain patients (n = 238,516). (c) LogOR of pain and depression event rates were calculated from the ketamine and pain patient cohorts. Negative values showing protective effect of ketamine. (d) LogOR of constipation, vomiting, and nausea were calculated from the ketamine and pain patient cohorts. Negative values showing protective effect of ketamine. 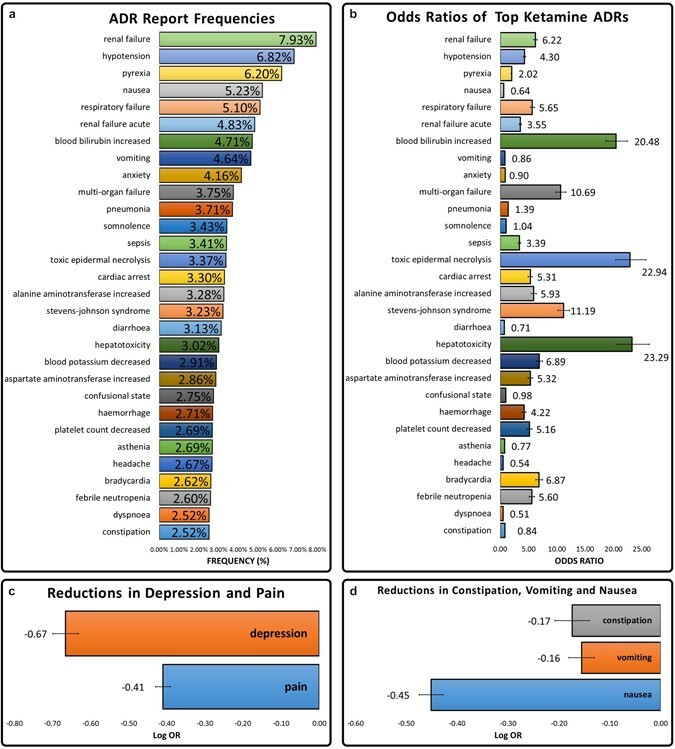 The analysis of the whole FAERS database revealed several other unintentional depression reducing drugs among antibiotics, cosmeceuticals and NSAIDS (Fig. 2). Our data supported previous studies that observed the psychiatric polypharmacology of minocycline, a tetracycline antibiotic14 (Fig. 2). The NSAID, diclofenac, was also observed to have some antidepressant properties (Fig. 2). It is theorized that both of these drugs may accomplish antidepressant effects through an anti-inflammatory mechanism15. Because of the antidepressant activity of several NSAIDs, we further separated the non-ketamine pain cohort. Ketamine patients were then compared to patients who received any other combination of drugs for pain excluding NSAIDs. It was observed that depression event rates remained low (LogOR −0.56 ± 0.035) (Fig. 2). The reduction of depression rates in ketamine patient records makes a case for study of ketamine as a psychiatric drug. These results imply that ketamine may be further explored as a monotherapy or adjunct therapy for depression. It should also be noted that FAERS data revealed that ketamine use lead to renal side effects and awareness and caution in patients with renal or hepatic impairment may be warranted (Fig. 1a and b). As an important side note, we also evaluated efficacy and side effects with the use of ketamine for pain management. We found that patients who were on ketamine had reduced opioid induced side effects including constipation (LogOR −0.17 ± 0.023), vomiting (LogOR −0.16 ± 0.025), and nausea (LogOR −0.45 ± 0.034) than patients who received any other combination of drugs for pain indications (Fig. 1d). Our data supports ketamine’s opioid-sparing properties and alludes to the fact that patients may receive benefits of improved pain, reduced requirement of opioids, and ultimately less opioid reduced side effects. The results of this study support previous small scale studies’ conclusions that ketamine is a good monotherapy or adjunct therapy for depression. In clinical practice ketamine would be especially useful for depression because of the quick onset of its action compared to existing first line therapies10,11,12,13. Regardless of the causative mechanism ketamine appears to have therapeutic potential for TRD. Further, the potential to reduce many of the most complained side effects of opioid treatment makes ketamine adjunct therapy for pain seem desirable. Overall, this study demonstrates that the therapeutic potential of ketamine can be derived from appropriate statistical analysis of existing population scale data. This study also outlines a methodology for discovering off label pharmacology of existing approved drugs. This method can be applied to other indications and may reveal new important uses of already approved drugs, providing reliable justification for new indications without large investments in additional clinical trials. The rest of the article can be easily accessed from the above Link.